Upper Beaconsfield champion Scott Pitcher (left) with president Nick Pastras after the spinner claimed his 500th senior wicket for the club recently. Picture: SUPPLIED. 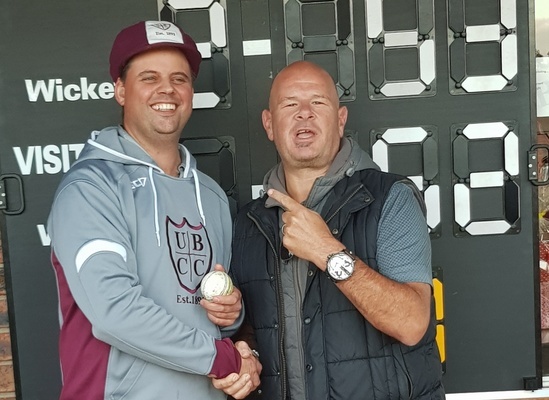 Upper Beaconsfield life member, legend and club captain-coach Scott Pitcher took the front page spotlight to lead the Maroons to a decisive win over a listless Cardinia on 22 December, and in doing so, he snared three wickets and passed an amazing 500 senior wickets for the club. Pitcher’s side ran through the Bulls with ferocity in their Premier clash at Upper Beaconsfield Reserve, with the club legend snaring an economical 3-13 off his 7.5 overs as the visitors could only reach 52. In a history-making day for the club, Pitcher even chimed in with the bat, making five not out as the Maroons rollicked their way to victory by eight-wickets. 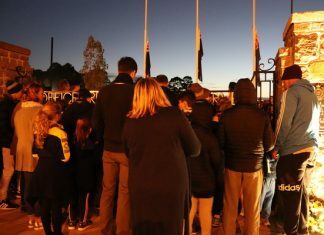 Bob Taylor A.M. and also life member recounted Scott’s first senior match as a 15-year-old in the late 1990’s when he also took three wickets in E grade. “He bowled three wrong ‘uns in a row, after I had been told he was a leg spinner,” mused the ex-captain. Scott Pitcher has been arguably the most successful and enduring leg spinner in the West Gippsland Cricket Association during the last 25 years. His achievements include a number of premierships for Upper Beaconsfield Cricket Club as well as Country Week representation on numerous occasions. Self-effacing, he often plays down his achievements noting he prefers to recognise team success rather than individual triumphs.